Palm Sunday is the start of Holy Week. On this day Christians remember the triumphant entry of Jesus into Jerusalem in the days before his Passion. People bring palm leaves to church where they are blessed by the priest. Some people decorate the leaves. People keep these blessed leaves in their homes. One of traditions of the Holy Week in the Philippines is reading of religious texts or „pabasa“. 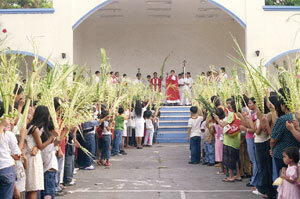 The pabasa usually starts after the mass on Palm Sunday. But it is also organized on other days of the Holy Week. The book of the passion of Christ is chanted in many different ways. The organizer of the "pabasa" prepares two books for the readers. One group of readers reads (chants) one verse and the other group of readers reads (chants) the next verse. Pabasa can last all day and all night. In some places the best reader at pabasa gets a small prize. Next to the chapel people make a tent or „kubol“ where the organizers serve food and drink for readers and other people present at pabasa. Most pabasas are public one, organized for the whole community. There are also so called private pabasas. They are organized by some families in their home. They invite relatives or friends to join them. "Pabasa" usually ends on or before Good Friday. What follows is the reading of "Siete Palabras" or the Seven Last Words of Jesus before he died on the cross. Everything is broadcasted on national tv. Many Palm Sunday processions are organized in different part of the Philippines. 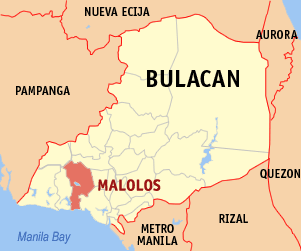 Malolos City (in Filipino - Lungsod ng Malolos), is the capital of Bulacan province. It has a population of 223,069 (2007). The city is located about 40 km north of Manila. The city name comes from Tagalog word „paluslos“ which means „downwards“. The name of city is actually result of misunderstanding. Spanish missionaries asked the locals what's the name of the place. They did not understand Spanish. So, they just said that the flow of the river in that part was downstream or "paluslos". Spanish missionaries than heard it wrong and remembered it as "Malolos" or "Malulos". In part of the city called Santa Isabel there is a famous Palm Sunday procession. In the procession there is an image of the Humenta or Christ on a donkey. Local women spread their traditional aprons or „tapis“ as the priest walks by. Gasan is a town of 29,799 (2000) people in the Marinduque province. 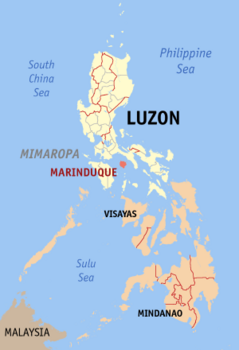 The province is actually an island located about 18 km of the biggest Filipino island of Luzon. In the local procession the priest himself rides a pony on the way to church. The same as all other parts of Holy week, the Holy Wednesday in the Philippines is known for its processions. The most famous processions on that day are those towns of Pakil, Majayjay and Paete. 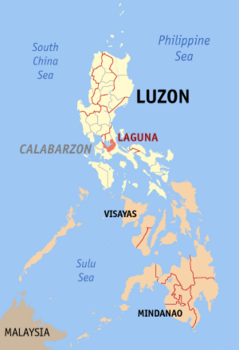 These towns are located in the Laguna province on the island of Luzon. Language used during processions is the ancient Tagalog. In the evening of Maundy Thursday the Mass of the Last Supper is celebrated in churches all across the Philippines. After the Mass, the Blessed Sacrament is put in an Altar of Repose or „monumento“. 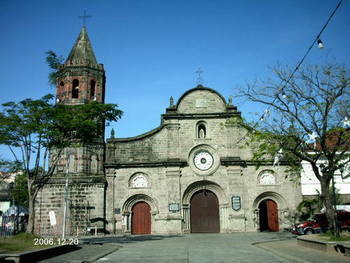 After that churches remain open for visit or as Filipinos say „visita iglesia“. The most impressive of events organized on Good Friday in the Philippines is the one in city of San Fernando. 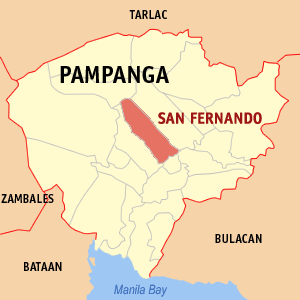 This city is located in Pampanga province on the island of Luzon. It is only 40 km away from the city of Manila. More than 1000 participants in this event are flagellates („mandurugo“). Men and some women make different kind of sacrifices like that of Jesus' for their sins to be forgiven. They beat themselves with sharpened chains and create wounds on their bodies. Their eyes are blindfolded. They are crowned with branches and leaves (usually those of guava). They walk barefoot in the scorching heat. They stop in front of a chapel or house where pabasa is read. There they turn towards them, fall on their knees, make a sign of cross and lay face down. People accompanying them then whip them. There are other ways of sacrifice. Some people dressed like Christ carry crosses. The same as those already mentioned they get whipped too. In some years more than 20 men and women are being crucified on wooden crosses. "Pabasa" usually ends on or before Good Friday. 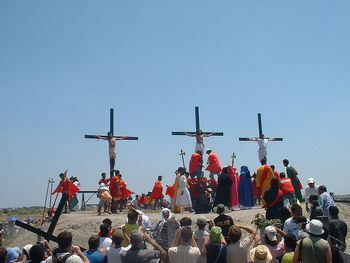 Then "Siete Palabras" or the Seven Last Words of Jesus before he died on the cross are read. Everything is broadcasted on national television. After that it seems that the whole of the country is mourning. Processions on Good Friday is the one of The Way of the Cross. People led by the priest walk from station to station contemplating the Passion of Christ. All together there are 14 stations. „Sinakulo“ is some sort of a play about the last days of Christ. They are often organized too. Actors and actresses in the play are local people. Early in the morning of Easter Sunday people in the Philippines organize double processions. Each starts from a different part of town. One procession has the Risen Christ and the other has the mourning Virgin Mother and Mary Magdalene carrying a bottle of perfume. In some parts of the country men are in the first procession and women are in the second one. Processions are followed by marching bands. People in processions walk at pace fast enough for them to arrive at the same time to the church or chapel. At the moment of arrival an angel, suspended from a roof top or tree top removes the black veil covering the face of the Virgin Mary. Other angels sing "Hallelujah". Everyone is very happy. People enter the church where they attend the holy mass. One more detail. The figure representing Judas is hanging on a tree. It's burned after the procession. Inside the figure there are coins hidden. They are symbol of money Judas got for betraying Christ. During burning coins are falling on the ground. It is a joy for children who try to collect them.